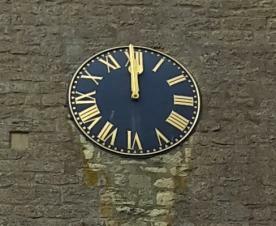 There is a public clock on the east side of the tower of St John the Baptist Church, Caldecott Road. The clock was installed in 1867 for £86 (about £6,732 in today's money). The 60ft high tower contains 5 bells - the treble by Thomas Eayre of Kettering (1744), the third and fourth by Taylor & Son of St. Neots (1819), and the second and tenor by Henry Penn of Peterborough (1727) - which are no longer functional. In 2012 an electronic carillon bell sound system was installed, which also sounds the striking of the hour.